ClariSaxFeast 2018 features guest artists, ensembles, workshops, master classes, displays and performances for clarinet and saxophone enthusiasts of all ages. Time: 9am – 1.15pm. Morning tea provided. For your child’s health and safety, if you are unable to accompany your child to this event, please complete the required Medical Consent Form. Note: Parents who are accompanying/supervising their own child/children do not need to register, only the children who are participating need to register. 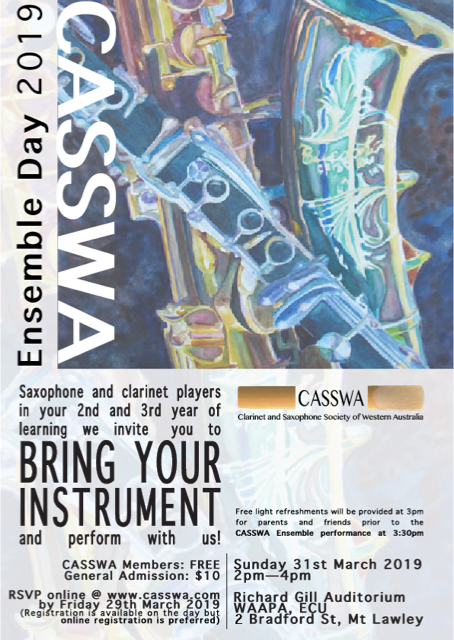 If you are a saxophone or clarinet player in your second or third year of learning, we welcome you to join us at our annual CASSWA Ensemble Day. All the event information and registration details for the 2018 Clarinet and Saxophone Ensemble Day will be announced asap. The Clarinet & Saxophone Society of WA (CASSWA) is delighted to partner with the School of Music (UWA) to host an afternoon session for ATAR clarinet and saxophone students. Students undertaking their WACE/ATAR practical music exams are invited to perform in front of an expert panel and receive individual feedback, plus helpful tips on performance etiquette and managing stress. An experienced accompanist will be provided to play with you, or if you prefer to bring your usual accompanist along, please feel free to do so. Audience members are welcome to come along to listen… a great opportunity for teachers and students alike! ClariSaxFeast 2017 features guest artists, ensembles, workshops, master classes, displays and performances for clarinet and saxophone enthusiasts of all ages. Time: 9am – 3pm, morning tea provided, lunch self-provided. Coffee van available.